This is a scifi fantasy novel, the sequel to The Black Dungeon Doorway. It combines the best elements of both science fiction and fantasy and is super modern and futuristic taking place on a far distant planet in the Universe. Leading from The Black Dungeon Doorway which is published by AuthorHouse UK it expands upon Character Classes introduced in The Free Show giving life to their profiles. There is great adventure, plenty of magic and technological devices and absolutely phenomenal battles. There is also a strong portrayal of the Theme of Light and Shadow. I maintain my highly descriptive and exciting style of writing. Planes Of Existence is Part 2, the sequel of The Black Dungeon Doorway, scifi/fantasy novel. This will give me time to promote and try to make a bestseller of The Black Dungeon Doorway which is already published by AuthorHouse UK. There is also a Free Draft Promo of it. 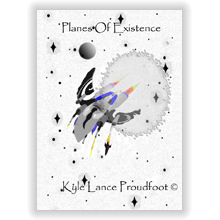 Planes Of Existence is published by AuthorHouse UK and is FOR SALE at Internet Booksellers such as Amazon.